Peterborough Northern Star were founded in 1905 as Northam Star, playing in the Peterborough & District League in four different spells - and under three different names - until 1930. 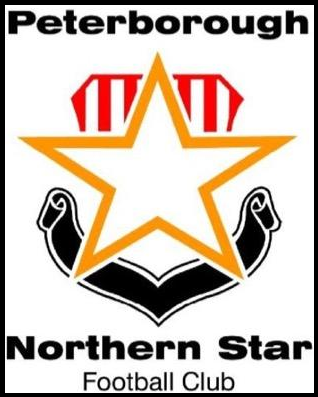 In 1931, a new team called Northam Star Sports Club emerging, taking over Eye United while also combining the Northam Star and Dogsthorpe Star works teams. This team then spent most of its time in Division 3 North of the PDFL before folding in 1959. The new club - once again called Eye United, named after where the team was based at the time - quickly became a dominant force in the PDFL, winning ten league titles between 1960 and 2003, including a season in which they won every league game on the way to the title (2000/01). After winning the league title in 2003, Eye United moved to their current ground in the Dogsthorpe area of Peterborough and earned promotion to the United Counties League Division 1. 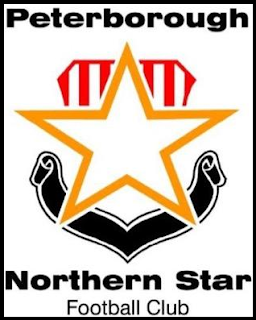 After two seasons at this level, the club changed its name to Peterborough Northern Star to avoid confusion, while also still reflecting the club's history. The club won Division 1 of the UCL in the 2008/09 season, but did not earn promotion to the Premier Division until finishing as runners-up the following season; they have remained in the Premier Division ever since, recording a highest finish of 6th in their debut season in 2010/11. Success has been limited in the FA Cup, with their best run coming in their debut season in the competition in 2012/13: they reached the 1st Qualifying Round, beating Wellingborough Whitworth and Thrapston Town before losing to St. Neots Town. In the FA Vase, Peterborough Northern Star reached the Quarter Finals in their debut season in the competition (2011/12), beating Rushden & Higham United, Ellistown, Boldmere St. Michaels, Armthorpe Welfare, Norton United and Tividale, before losing 4-3 to eventual winners Dunston UTS at home in front of a record crowd of over 600. It's very rare (virtually unheard of, in my experience) for there to ever be any football to watch on my birthday, so when I saw this game pop up in Yaxley's fixture list, I jumped on the opportunity to watch some football on my birthday - my 18th birthday, in this case - for the first time ever, and to tick off a new ground in the process. Before the game, my dad took me to Toby Carvery for dinner and gave me a new camera as my birthday present. Afterwards, we headed to the ground and, with some difficulty, found somewhere to park up before going into the ground, picking up an excellent programme (my awful photo doesn't really do it justice) on the way in. Speaking of programmes, one of the committee members of Yaxley was here as well (partially as a fan, but also because he works with one of the PNS youth squads), and as I was doing my circuit around the ground he asked me if I wanted to become Yaxley's programme editor which, despite a few reservations, I decided to do; I didn't do my first programme for a month after this, but I have been doing them ever since. Unfortunately, my excitement at watching a game on my birthday came to nothing, as Yaxley simply didn't turn up and were swept away by a Peterborough Northern Star side who simply wanted it much more. I can't find a decent march report anywhere, but I do know at least that Goldson-Williams gave PNS the lead after 19 minutes, before Matt Sparrow equalised early in the second half. However, goals from Sansby and Murphy in the final 10 minutes gave Northern Star a deserved victory. Chestnut Avenue is another fairly basic ground, but it does have some character at least, with not an Atcost in sight. Behind the near goal is a covered standing area - similar to the one at Swaffham - which could probably hold around 100 people, while there's another more ramshackle area of cover on the near side, which could probably also hold 100 people at a stretch. The only seating at the ground is provided by two 50-seater stands - one either side of the dugouts - which, as you can see from the photos above, are very low to the ground in the front rows (hence why the perimeter fence is in the way of all three photos directly above this section). Other than this, the rest of the ground is open hard standing, with there being no cover behind the far goal but plenty of potential for ground expansion should the club rise further up the leagues. The record attendance at Chestnut Avenue (as far as I can find, at least) is over 600 for the FA Vase Quarter Final against Dunston UTS.